The release of the 2007 edition of the National Statement provided a mechanism for exempting work with de-identified data where the work involved no more than negligible risk. The ‘pressure to publish’ has meant a significant amount of work that used to be conducted as an evaluation or for quality assurance is now being submitted for publication to refereed journals. Figure 1 – A version of this image, which is not watermarked, is available from https://www.patreon.com/ahrecs with a USD3/month subscription. Stakeholders and funders require services and expenditure to be based on robust evidence and analysis. 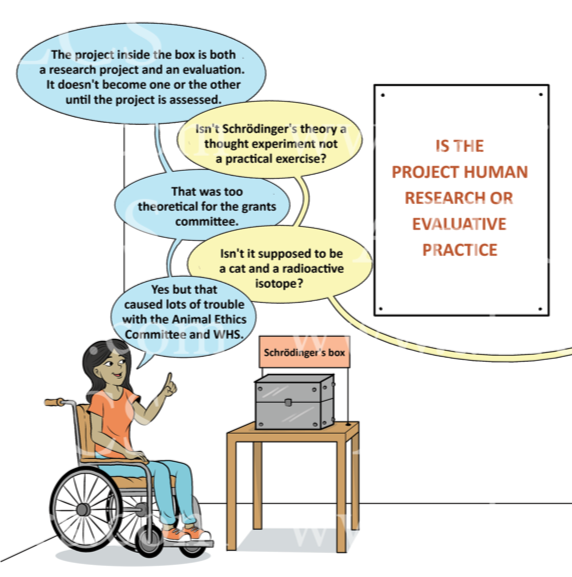 As a result,the distinctions between research, evaluative practice and quality assurance have become blurred to the point of no longer being helpful and the research ethics review mechanisms for exemption, proportional review and mandated HREC review in specified circumstances, might be sufficient for the appropriate handling of evaluative practice. Nevertheless, submissions to the NHMRC’s Australian Health Ethics Committee prompted the release in 2014 of Ethical Considerations in Quality Assurance and Evaluation Activities. at provision (e) describes circumstances where consideration of the need for review is required  and, where it is, offers guidance at provision (f) to appropriate levels of review. ethics review by an HREC or another review body. Given many staff will want to publish the outcome of evaluations and there will be academic interest in matters related to evaluations/quality assurance, the institution’s arrangements must not preclude academic publication. The institution needs to know what evaluative practice is being conducted and so must have a mandatory process for review that is similar to a scientific research review committee, but is also an institutional policy process (its review feedback should provide advice to facilitate the planned activity and relate to how to conduct the work ethically and successfully). There is a mechanism for the research review of evaluative practice/quality assurance, with some such reviews being delegated to a special panel or administrative review. The review pathway being initially determined by the responses to a sequence of yes/no questions. The responses to the questions being reviewed by an ethics officer(in the case of clinical audits this the person conducts the initial assessment will need relevant clinical expertise) who confirms the review pathway. Every 12 months a small proportion of evaluative projects are randomly selected for audit, not to revisit the decision but to confirm the process is working correctly. Policy and guidance material informs the ethical design, conduct, reporting and publication of evaluative practice/quality assurance, as well as its ethics review. For researchers: summarising the institution’s arrangements for evaluative practice/quality assurance (including a summary of their responsibilities). For heads of school/department: discussing their role in the review of services/procedures/teaching and learning in their area. For editors/publishers: explaining the institution’s arrangements, for provision by researchers if they are asked to provide a copy of the HREC approval. If the institution has a network of collegiate Research Ethics Advisers (see our earlier blog post about REAs) some advisers should be experienced in the conduct of evaluative practice. Available for USD10/month to subscribers, AHRECS has created notes to inform the in-house development of A, B and C. A USD15/month subscription provides access to our growing library of materials. 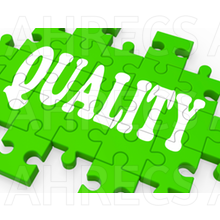 AHRECS would be delighted to discuss an arrangement where we provide feedback on the materials you produce in-house or us producing the materials for you. 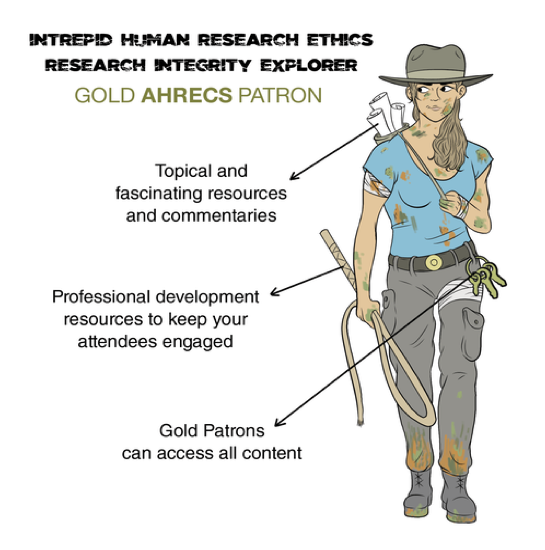 Email us at Patron@ahrecs.com with any question about our Patreon page or becoming a patron, or Evaluative@ahrecs.com to discuss how we could assist you with regard to the ethics of evaluative practice. Because of design factors such as the deception of participants, and participant factors such as research with Aboriginal and Torres Strait Islander people. organisations provide guidance and oversight to ensure activities are conducted ethically including a pathway to address concerns. None of the triggers for consideration of ethics review (listed below) are present. ‘Organisations should develop policies on QA/evaluation which provide guidance for oversight of QA or evaluation activities. It is recommended that such policies address the following issues’. Where the activity potentially infringes the privacy or professional reputation of participants, providers or organisations. Secondary use of data – using data or analysis from QA or evaluation activities for another purpose. Gathering information about the participant beyond that which is collected routinely. Information may include biospecimens or additional investigations. Testing of non-standard (innovative) protocols or equipment. Preferably prior to data collection commencing, but in the case of data collected prior to the adoption of this document, the check must occur prior to any use of the collected data. A Panel should be created for the purpose of conducting these reviews. Even though there are undeniable advantages from this panel being comprised in full (or at least primarily) of members of the institution’s HREC, it must be stressed to Panel members there are important and valid differences between academic research and evaluative practice. For this reason, a proportion of the Panel members should not be drawn from the HREC and should be experienced in the conduct of evaluative practice. A template for the institutional policy and suggestions for the associated guidance material can be found in the AHRECS subscribers area https://www.patreon.com/posts/25446938. Available for USD15/month patrons.